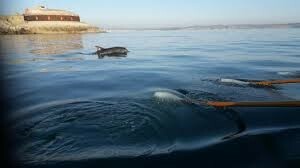 A friendly bottlenose dolphin has taken up residence in Portland harbour and is charming all water users. The dolphin has been playing with boats, swimming with locals and keeping an eye on our mooring contractor while inspecting and working on moorings. The link below is to an article by the latter in the local paper, containing also video footage shot by one of the dive team.